Fig. 11 -6. Command Decoder Block Diagram. • High-Level Discrete Command. A +28 V, 10 to 100 ms pulse used to drive a latching relay coil or fire an ordnance device. • Low-Level Discrete Command: An open collector or 5 V pulse typically interfacing with digital logic. A serial command is a 3-signal interface consisting of a shift clock, serial command data, and a data enable used to indicate the interface is active. A portion of the received command message bits (typically 8 or 16) is sent in serial form to a user subsystem. The terms data handling and telemetry are often used interchangeably. However, data handling is more than just telemetry. IEEE Standard 100 offers this definition of telemetry. Telemetering (remote metering). Measurement with the aid of intermediate means that permit the measurement to be interpreted at a distance from the primary detector. The distinctive feature of telemetering is the nature of the translating means, which includes provision for converting the measurand into a representative quantity of another kind that can be transmitted conveniently for measurement at a distance. The actual distance is irrelevant. Fig. 11-7. Data Handling Unit Block Diagram. greatest frequency component contained in the signal. (See Sec. 13.2 for a more in-depth discussion on data rates.) Data from all inputs is converted to digital form and formatted into a serial stream of continuous data for downlink. The data rate is the sum of all input sample rates plus some bandwidth for insertion of synchronization codes and a frame identification counter. IRIG Standard 106, Chap. 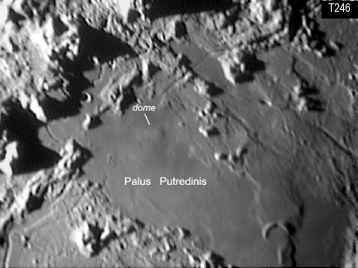 4, provides a detailed discussion of downlink telemetry formats and associated format terms. The data handling system may also supply telemetry to an onboard computer. The computer sends its request to the data handling system which processes the input and returns telemetry data. This operation is interleaved with downlink telemetry gathering which is usually continuous. Analog telemetry data comes to the data handling equipment in many forms. 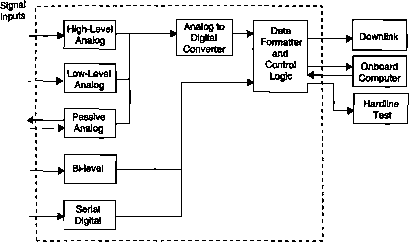 Often, direct transducer outputs require signal conditioning prior to conversion from analog to digital form. Data handling hardware is simplified, however, when input signals are preconditioned or fall in the general categories described below. ■ High-Level Analog: A telemetry channel with information encoded as an analog voltage, typically in the range of 0 to 5.2 V. These are active analog inputs in that the command and data handling system does not provide measurement excitation. Data handling equipment converts this information to digital form. • Low-Level Analog: A telemetry channel with information encoded as an analog voltage. The signal range is low enough to require amplification before the information is encoded into digital form. Typical gain values fall between 100 to 300. Because of the signal's low voltage range, it is subject to noise contamination and thus uses an interface in which the telemetry information is the difference between signal and reference inputs to the command and data handling system. This is differential or double-ended interface. • Passive Analog: A telemetry channel with information encoded as a resistance. The command and data handling system supplies a constant current to the resistive sensor and encodes the resulting IR voltage drop into a digital word. All analog telemetry is converted to digital form within the command and data handling system. The system determines data resolution by the number of quantization levels. More information on this topic may be found in Chap. 13. • Bi-Level (Discrete) Input: A telemetry channel conveying two state information (such as on/off or enable/disable). Information is encoded as voltages, but may be encoded as a resistance or the presence or absence of a signal. Typically a logic 0 = 0 to 1 V, and a logic l=3Vto5V(or3Vto28V). • Serial Telemetry (Digital) Interface: A 3-signal interface used to transfer digital data from an external source to the data handling equipment The command and data handling system provides a shift clock and an interface enable signal to control data transfer. Interface circuits may be differential line drivers or single ended. Serial rather than parallel interfaces are preferred on spacecraft, because they simplify cable design and require fewer interface circuits. Table 11-27 summarizes the command and data handling subsystem estimating process. The desired output of this process is a reasonable estimate of the hardware necessary to support the mission including estimate of its size, weight, and power. Use this table in conjunction with Tables 11-28 and 11-29 to assist in estimating the system parameters in the case of unknowns. The results may then be fed back into the mission design process and adjusted as necessary. FireSat has been used as an example to illustrate the process and highlight the main points of estimating when the majority of needed inputs are unknown or flexible. Step 1—Identify Functions to be Performed by the C&DH System. The first step in baselining die command and data handling system is to define the primary functional requirements needed to monitor and control the spacecraft. At a minimum, most missions require command processing and housekeeping data acquisition. The size and complexity of these two systems is determined by the spacecraft design, the technical requirements, and additional functions and subsystems supported. There are three primary considerations for baselining a command decoder. Table 11-28 gives guidelines for channel counts and sizing. As the spacecraft design evolves, we refine the needed quantities and types of channels. Whenever possible, interfaces to the C&DH system should be standardized as a means of saving cost but this is not mandatory. The C&DH system is an excellent place to put spacecraft functions that do not seem to fit anywhere else.